☛ [Compatibility]: Designed for the Apple iPad Pro 12.9" 2018 only. Not compatible with other iPad models. ☛ [Face Recognition & Apple Pencil Compatible]: The large cutout for the front camera and microphone allows for seamless face recognition and ensures premium sound quality. Only 0.3mm thick, this screen protector maintains high touch sensitivity when using the Apple Pencil. ☛ [HD Protection]: Up to 99% high transparency, the full-coverage glass screen protector preserves the iPad's original HD Retina quality while protecting the front camera against dust and scratches. 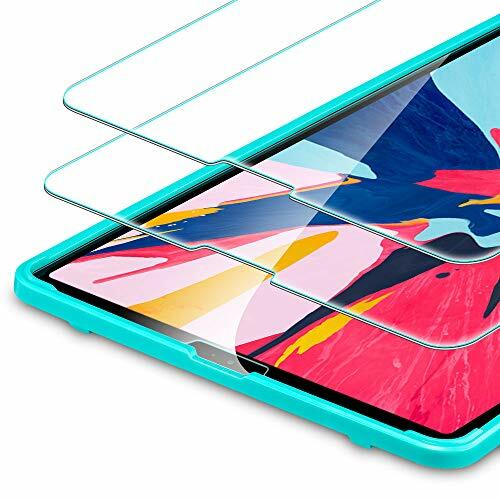 ☛ [Scratch-Resistant]: Premium tempered glass protects your screen from unwanted scratches by keys or other hard objects because of the industry-high 9H hardness rating. ☛ [Easy Installation]: With ESR's self-installation kit, you only need to attach the installation frame to the iPad and place the screen protector over the holder for perfect alignment without any dust, bubbles, or dirt.